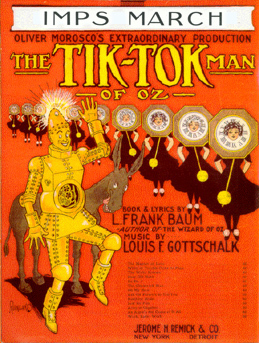 This fascinating and little-known piece of orchestral music from L. Frank Baum and Louis F. Gottschalk's 1913 musical The Tik-Tok Man of Oz was first discovered by the late James Patrick Doyle and me in early 2001. Since this piece is not listed on the published sheet music, one wonders if other pieces of instrumental music might have been published, too, and are still unknown. After I obtained copies of the published piano reduction, James proceeded to orchestrate it. This was one of the last things James completed before his untimely death in 2002. Flash [known in the Oz books as Kaliko] pushes a button and a bell rings. The Metal Imps appear in different parts of the rocks, bearing great golden shields, which almost hide their forms, and zig-zag swords tipped with red electric lamps. 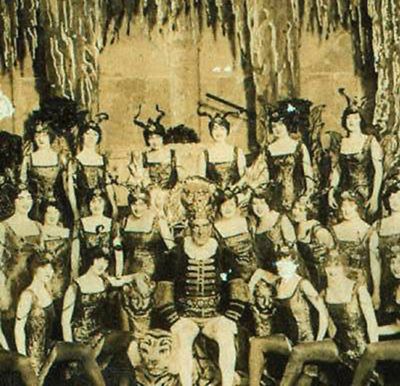 So sit back, listen to the lovely mp3 version of the Imps March from The Tik-Tok Man of Oz! Listen to the IMPS MARCH!